Though considerably overshadowed by the Commonwealth's official "Remembrance Day" on Friday 11 November, last week saw another significant Day to Remember. Sixteen years after environmental justice campaigner Ken Saro Wiwa was judicially murdered by the Nigerian state on 10 November 1995, Friends of the Earth International groups commemorated "Heroes and Martyrs in the Struggle Against Mining, Oil and Gas". FOEI highlighted Saro Wiwa, along with fifteen others who have gone to their deaths in that struggle - the latest being Father Fausto Tenorio in the Philippines. See: Philippines: Where is the safety? "We demand an end to the repression against those who defend life and an end to the criminalization of the people who defend their territories. The work of our heroes shall not be in vain." In recent years governments have encouraged foreign investment in mineral rich countries in the framework of free trade agreements in order to exploit natural commons, converted into resources and commodities in the capitalist logic. The extractive industry of endless accumulation and accelerated irrational exploitation of nature brings a new form of appropriation of land and territories in the hands of large multinational corporations, in the process robbing communities and peasants of their means of subsistence. The imposition of mega projects such as mining, oil and gas, has left contaminated water, acid drainage, emissions of greenhouse gases, deforestation, loss of biodiversity and of mangroves, swamps and rivers, and the total destruction of ecosystems. The impacts on human health in affected communities are irreversible. Death comes not just from their toxic operations but also through repression and violence accompanying extractives, resulting in the killings of women and men who have lost their lives in the resistance to stop this destruction brought by mining, oil and gas with the hope of better ways of life for mankind. Large corporations and governments complicit to the interests of the extractive industry, continue to impose mega projects, social and environmental destruction, with deception, illegal actions, enforcement, repression and criminalization of social movements. Nevertheless, everyday resistance movements strengthen, grow and multiply around the world. Today, November 10, International Day of Commemoration of the Heroes, Heroines and Martyrs of the Resistance against Mining, Oil and Gas, we take a moment to denounce the actions of transnational corporations and demand justice for victims. 1. Stop repression against defenders of life and the territories. Adhere to international human rights instruments. 2. Stop criminalization of social movements. End laws criminalizing the just demands of the social movement. 3. No more killings of those who defend natural commons. Justice for the crimes committed against them. 4. End collusion between governments and extractive industries. Today, on the 16th anniversary of the murder of Nigerian writer Ken Saro-Wiwa - a day of remembrance of the victims of mining, oil and gas - Friends of the Earth International releases a new report and renews its commitment to the struggle for justice for the communities who suffer the consequences of extractive industries. The new report , released on November 10, is entitled 'Memory, Truth and Justice for Heroes in the Resistance against Mining Oil and Gas' and exposes the murders of many human rights and environmental activists all over the world for defending their rights and natural resources. Ken Saro-Wiwa and eight other Ogoni leaders were executed on 10 November 1995 for speaking out against the impact of Shell and other oil companies in the Niger Delta. "Ken Saro-Wiwa was a hero who died because of the world's addiction to fossil fuels. His words still ring true in our ears today. This is why we set November 10 as a day of remembrance of the victims of mining, oil and gas. We demand that those who have orchestrated the murder of people for the sake of profits should be held to account. We also demand environmental justice and an end to fossil fuels: be it crude, tar sands or coal." Romel de Vera, coordinator of the Resisting Mining, Oil and Gas program of Friends of the Earth International, said: "We condemn the fact that many governments favor and protect the interests of extractive industry corporations instead of the right of communities to land and resources. The list of community rights defenders, environmentalists and social activists killed in the course of their struggle against mining, oil and gas continues to grow even longer. 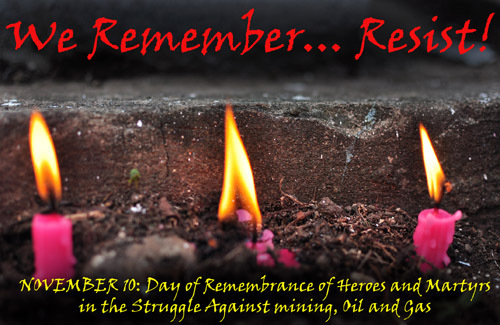 "On November 10, remembrance actions are held all over the world to commemorate their heroism and celebrate their lives and struggles, as well as to condemn the culture and cycle of death forced upon us by the extractives industry." Natalia Atz Sunuc, coordinator of the Resisting Mining, Oil and Gas program of Friends of the Earth International, said: "Many brothers and sisters have been murdered in Asia, Africa, and the Americas for defending life and their territories. We demand an end to the repression against those who defend life and an end to the criminalization of the people who defend their territories. The work of our heroes shall not be in vain".